Japanese Episode DP 003: "A Rival Battle! Three vs. Three!!" 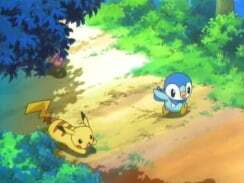 American Episode 467: "When Pokémon Worlds Collide"
As Satoshi continues his search for Pikachu, he sees a powerful electric attack in the distance. Thinking the attack is coming from Pikachu, Satoshi and Takeshi rush to the source to find a trainer named Shinji and his Elekid. Shinji is a young trainer who releases pokemon he deems as being "useless," and this attitude rubs Satoshi the wrong way. 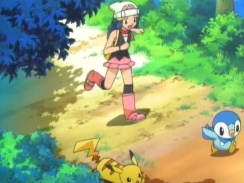 Suddenly, Satoshi sees a Volt Tackle attack in the distance and runs toward it, thinking it belongs to Pikachu. When he arrives, he finds his Pikachu being held captive by one of the Rocket-Dan's mechas! Satoshi jumps onto the mecha to retrieve his pokemon and eventually succeeds in sending the Rocket-Dan blasting off again. After reuniting with his pokemon, Satoshi and Takeshi introduce themselves to Hikari, who had been watching the battle the entire time. 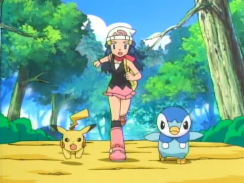 They return to a nearby Pokemon Center where the the three trainers decide to travel together throughout the Shin'ou region. As they head outside to start on their journey to Kotobuki City, they find that Shinji has been waiting for them! 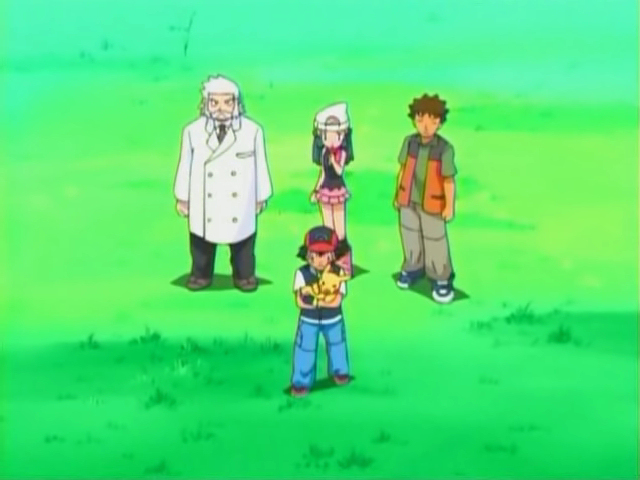 The trainer from Tobari City challenges Satoshi to a three-on-three battle to prove how weak he is. 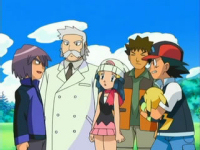 Shinji's Mukkuru is able to defeat Satoshi's Mukkuru, but his Hikozaru is unable to defeat Aipom's Focus Punch attack. The final match-up pits Pikachu against Elekid and ends in a draw. Shinji releases his Mukkuru for being too weak and resumes his journey as Satoshi glares at his new rival. 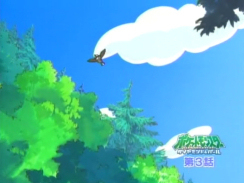 After the pokemon rest up, Satoshi, Hikari, and Takeshi begin their journey through the Shin'ou region. Ahhhhh, Shinji. After nearly a decade of annoyingly happy go-lucky trainers, it's refreshing to see a jerk like him shaking things up. 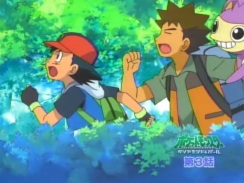 Shinji will continue to anger Satoshi by releasing pokemon after pokemon in future episodes, so those of you who liked what you saw here will have plenty to look forward to. 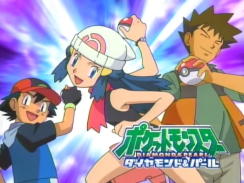 Other than the introduction of Satoshi's rival, Hikari officially joins the group. 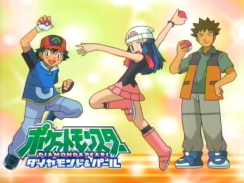 I find it disappointing that Satoshi and Takeshi don't so much as mention Haruka when Hikari mentions her goals of being a Pokemon Coordinator, but I guess the writers used up their one example of remembering the past with that Rumika cameo in the previous episode. *sigh* We also get to see Satoshi's Pikachu gets beaten by a beginning trainer's Elekid even though it just took down a Regice a few episodes earlier. While fans could argue that Pikachu got a power down after the first Advanced Generation episode, the same can't be said for this series, where there's no reason for Pikachu to be as weak as it is in this episode. Paul sounds way older than he should, but so does Shinji, so I can't really be too hard on either one of them. 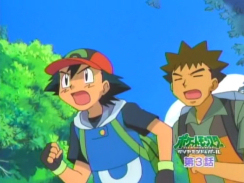 I'm just glad PUSA didn't give Ash's rival that Gary voice like so many of us were afraid they would. In the Japanese version, Kimi no Soba de ~Hikari no Teema~ is used as the closing theme. Elekid keeps its Japanese voice. 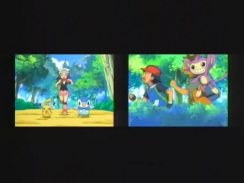 The opening scenes of the episode that sort of recap what's been going on so far are removed from the dub. The shot of Mukkuru that starts the episode off is then shortened by a second. 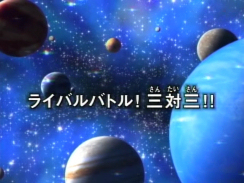 Also, the title screen is, predictably, removed. Hopefully, all of these cuts will be restored once this airs as a regular episode. End English Episode 466, about three and a half minutes in. The eyecatches change another time to add Takeshi to the group. Only one more update to go! Paul: "The name's Paul, and from the looks of things, you must be Professor Rowan." In the Japanese version, he also said that he's from Tobari City (Veilstone City). Any good ADR supervisor should have been able to fit that information into the above line, so I don't really know why it's omitted from the dub. 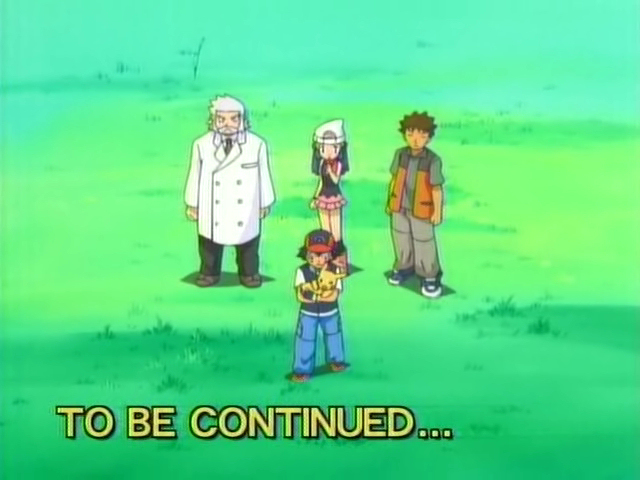 You know how, back in the Pokémon Chronicles era, 4Kids would remove the TO BE CONTINUED text from each and every episode? Well, PUSA sort of does the same thing here. Except in this episode, they don't break out their digital paint artists...instead, they simply slow down the final zoom-out shot so much that the episode's over before the video has time to get to the TO BE CONTINUED text. Also, PUSA freezes the final scene to make it three seconds longer than it was in the Japanese version.